A petty cash also known as the petty cash fund is referred to as a small amount of cash used to pay a nominal sum of cash which a business owes. The person who is responsible for handling the petty cash is known as Petty cash custodian. Whenever the available cash is low the custodian in charge informs of the low cash to regulate the cash flows. The amount of petty cash needed is limited. It varies from organization to organization. The petty cash is made available because it would not seem sensible using cheque instead for a nominal amount of cash. The petty cash fund is present in every organization to facilitate different departments working to pay off small amounts the business owes. Whenever a certain department needs cash it has to fill in the petty cash request form. 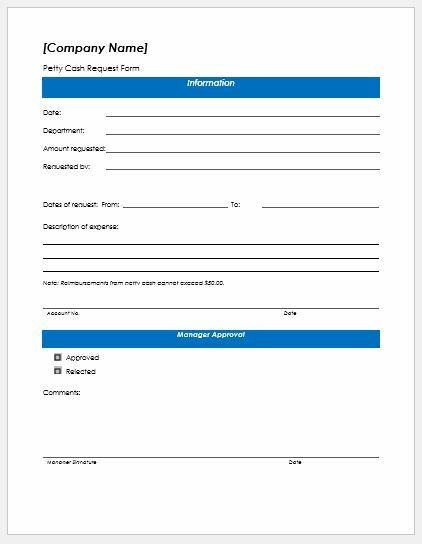 The requested form after filling would be sent to the purchasing department. Department number: The department requesting for cash will have to enter its specific department number here. Date: The date on which the requested cash be made available should be stated. Reason: The reason behind requesting the cash should be therein mentioned. Name of receiver: The person receiving the cash amount be mentioned. Signatures: Signature of the department head and the person approving should be present. Once a department feels the need for petty cash, it must fill in the petty cash request form. The form will be filled with the above-mentioned details. The department head after verifying the request will send it to the purchasing department. After which the cashier will hand over the amount to the requesting department. It can certainly not happen that the petty cash fund is empty. Whenever the petty cash fund is low the custodian therein makes a request for cash as to manage cash flows. No writing of too many cheques nor signing them up and then going to the bank for encashment. The petty cash has it all for you.